“Coeur en Feu” (Burning Heart) is a new spectacle of MFA AcroDance on Fire productions, performed by seven artists of different backgrounds. This show contains elements of dance, acrobatics, and fire effects. "Wherein harmony appears to be illusion and falls apart in desolation. A search for a new balance starts, when synergy is built upon individual differences". Coeur en feu invites you into a world of energetic interactions, raw beauty and true magic. Artists: SaarArts, Ruslan, Lieve, Elke, Elger. 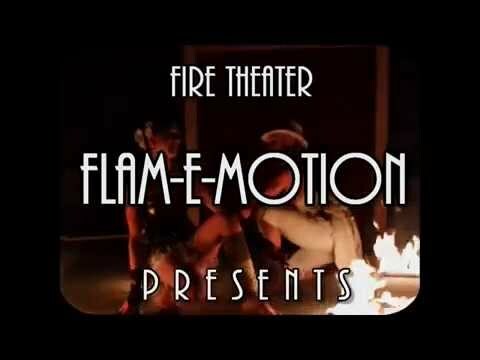 Mystic Fire Theater is the larger version of Flam-E-Motion duo ‘Mystic show’. In combination with three extra artists, this show turns out in a grandiose fire spectacle. Mystic fire theater is based on a poetic and strong story line and performed with spectacular fire choreographies. Ideal as an opening or closing act for your event! Variété Flambé is an hilarious fire circus, formed by two different and kittenish characters. Together, they combine elements of cabaret, burlesque, swing, tango and circus. Their act is a play of interest and ignorance, a game of jealousy and admiration, a story of desire through repellency. This show is filled with surprising fire effects, hilarious moments and spectacular circus skills. AcroDance On Fire is an exclusive and elegant fire dance duo. They combine fire, acrobatics, theater and movement in ‘one whole’ performance. This show contains acrobatic fire sword fighting, partner poi spinning with acrobatics, fire hoop dance, fire effects and incredible dance lifts! All brought in a beautiful and compelling story line. This show can be performed at indoor and outdoor events. We also have a 'wedding special’ of this show. Dressed in white mystical costumes or in black elegant outfits. The Mystic show is a powerful and theatrical fire dance show, overwhelming and poetic at the same time. The artists express with their strong and flexible body language, the energetic spirit between man and woman. This show includes elements of theater, dance, yoga, circus arts and multiple fire spinning techniques. The artists transform these elements into their own unique style. Typical in this show is the powerful atmosphere of attraction and repellence, seduction, romance, male power and feminine elegance, brought in an artistic and abstract atmosphere. The Sparkling Swing is a refined, humorous and exciting performance, with elements from swing, burlesque and circus arts. During this show, two divas try to define their place next to each other, in a game of ego, fun, jealousy and attraction. The theatrically overacting characters will steal your attention with their stage presence, outstanding partner fire techniques and unpredictable story line. 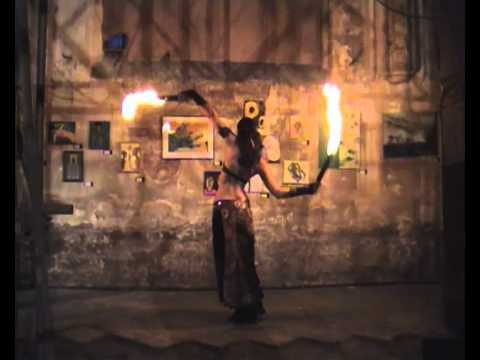 Saar-Arts performs mystical and rousing fire dance shows. As creator of ‘MovingFireArts’, professional fire dancer and choreographer since 2007, she was visible inspired by different dance styles and influences, such as flamenco, Oriental dance, AcroYoga and contortion. With elegance and graceful movements, She transformed these elements into her own unique style.